This salad recipe gives a salad a good rep – a salad which previously was in the boring bracket when it comes to meals can now be a celebrated, healthy and robust dish that can easily act as a dish on its own for either lunch or supper, not the dull side companion to the main event. It really is great how we are becoming much more health conscious – something seriously has gone wrong somewhere down the road when it comes to the Western diet with obesity being higher than ever before, high blood pressure and heart attacks. However there still has to be a balance, and it saddens us to see people take it too far and take all the fun out of eating! We want to eat something that is going to make us happy and nicely full and also tastes delicious, but for those who take it too far it can end up unhealthy and actually quite dangerous. The obsession over eating raw, superfoods and calorie counting is getting out of control, when at the end of the day there is nothing better for you than good quality seasonal produce. So the search for a good balance continues, and a tasty and varied salad is a good way to start – something that is full of colour and texture. Taste is number one, seasoning with sea salt, freshly ground pepper, herbs and a banging dressing. 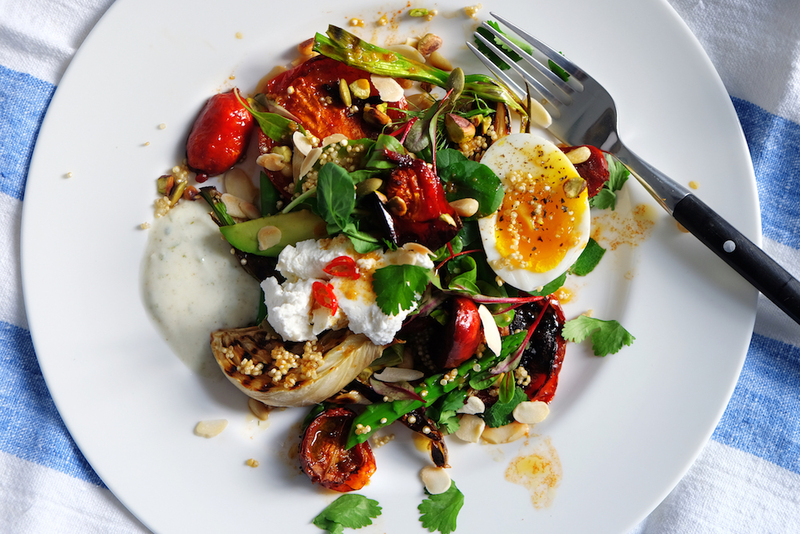 Balancing sweet, sour and spice is also important, in this salad we get the spice from the zingy dressing, the sweetness from the caramelized fennel and the sour from the goats cheese. Texture wise there is the chewy chorizo, the soft lambs lettuce and the crunch from the nuts, we are big fans from adding a roasted chopped nut to a salad of veg dish. We would say that this salad would make most happy (just remove the chorizo if you are a veggie), its even good for boys! On shoots we have to think carefully when menu planning as we are not only feeding the models but the photo team and camera men who are heavy lifting all day and need a good feeing when it comes to meal time – this recipe would do the trick. I would even go as far as saying I would serve it to our Dads who look so depressed when the word salad is mentioned, Lucy’s Father is a farmer and Jemima’s an Architect, both love good food but not into fussy itzy bitzy salads, but I think even they would both be content after finishing it up. It would go very well with some toasted sourdough and olive oil on the side and a glass of cold white wine. 10 Asparagus, steamed for 5 mins. Slice to your liking. Preheat your oven to 220 degrees. Place your tomatoes on a tray, mix together your smoked paprika, 2 tbsp olive oil, good squirt honey and pressed garlic- dribble this all over the tops of the tomatoes- would be nice with added thyme too. Cooking time up to 30 mins. in a separate tray add the sliced fennel, spring onions and sliced chorizo (giving room, spreading it out)- sprinkle with olive oil and season. Place in the oven for at least 20 mins or more, nice to get caramelized and charred. Cook your quinoa (make sure thoroughly washed before) to the instructions on the packet. We like to add a little powered stock to the boiling water and lemon juice for flavour. Set aside when cooked. Mix your yoghurt ingredients in a bowl and the separately your dressing. Arrange your salad ingredients to your preference between the 4 plates, mix over your dressing. Adding the sliced soft boiled egg to the top and the crumbled goats cheese, coriander leaves, nuts and chili. Nice to dollop the yoghurt mix on the side. Serve with a lemon wedge and maybe some griddled sourdough.